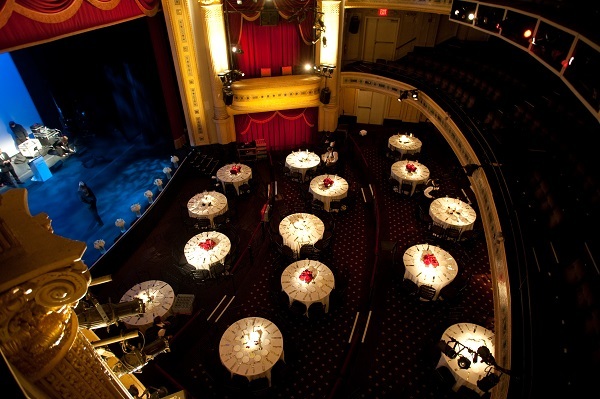 Hudson Theatre New York wedding. Hudson Theatre NYC. Toby and Brian share a love of the theatre so it was only fitting that their wedding be on stage on Broadway, at the beautiful landmarked Hudson Theatre, right in Times Square. We used the grooms' engagement story (the proposal happened on the love locks bridge in Cologne, Germany) as a theme. We built a replica of the bridge as a design focal point for the wedding, and had guests’ names and table numbers engraved into the locks as seating assignments. It was a beautiful way to share the story of Brian and Toby. One of the other special parts of this wedding was the emcee, Raven, a fabulous queen you may remember from RuPaul's Drag Race and Drag Race All Stars. Raven performed three songs and emceed all of the nights events. It was an absolute blast working with her and producing this fabulous wedding for Brian and Toby. After the wedding, the grooms said, "Thank you! We made a great team! We are still riding high on cloud nine from such an unbelievable night." Enjoy the photos below by Kelly Guenther Studio.